What happens when the batteries go dead when the gun owner is in a life or death situation needing the gun to save their life? What happens when the gun is in the opposite hand from the watch, wrist-band, or hand with the RFID embedded chip which is occupied holding their child’s hand or a phone with which they are trying to call the police while in a life or death situation? What happens when the bad guy has a transmitter broadcasting on the same frequency as the RFID chip and the gun owner is in a life or death situation? Why do no law enforcement organization or military use this technology on their guns? The gun owner and perhaps other innocent life die because of a dead battery. The gun owner and perhaps other innocent life die because the RFID chip is out of range. The gun owner and perhaps other innocent life die because the RFID chip is blocked from authorizing the gun to shoot. Because they are smart enough to know the technology will put them and other innocent life at risk. 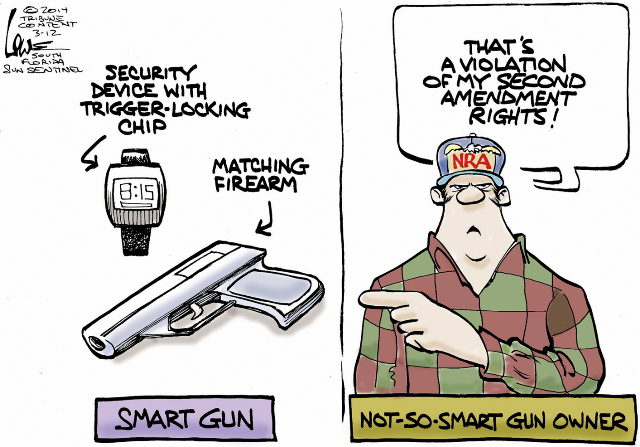 And furthermore the NRA and most gun owners don’t have a problem with the existence of “smart guns”. They have a problem with and correctly do object to the mandating of “smart-guns” on Second Amendment grounds. “Smart guns” aren’t smart except in some very limited circumstances. This cartoonist isn’t very smart and should seek help for their prejudice. This entry was posted in Crap For Brains, Gun Cartoon, Smart guns by Joe. Bookmark the permalink. I wonder how many cartoons there are detailing cartoonists that are drawing about things they clearly know nothing about? I found the advertisement and information blitz fascinating for the IP-1 as every article I recall reading or piece of information from Armatix talked about how it is desirable because it has features to prevent it from shooting unless specific requirements are met. It’s strange trying to sell a gun by advertising how it doesn’t shoot. I don’t recall ever seeing any commentary or media on it shooting, how it handled, or how it performed. It seems like a pretty ill begotten sales pitch to specifically target people who will never be your customers while ignoring your target demographic. The idea is to make it mandatory. Then it won’t matter if anyone likes it. Honestly, I do not recall a functional one ever being fully demonstrated, much less released into the wild. I might be wrong on both points, though. Points 1 through 3 (dead gun owners) are features, not bugs. Very good point. In the view of this cartoonist that is almost certainly true. But that doesn’t make the gun owner “not-so-smart”. It does make the gun owner smarter than what the cartoonist thought he was which may be a big part of why the cartoonist is upset. Often “not-so-smart” is code for “Not falling for our propaganda”. I make it a policy to not trust life and death decisions to a cartoonist. Especially an ignorant one. I wonder what he would say if his First Amendment rights to make his garbage art were linked to an RFID band he has to keep close to his computer. It should make him feel like a criminal that has to be tagged, like he proposes. Here’s where I disagree about the technology. It should never be implemented or allowed because it will be abused and it will cost many more innocent lives than it could ever save. Negligent deaths due to kids picking up guns is a sad, but vanishingly small number. Usually less than 50 with over 300 million guns in the hands of 100 million owners. That is statistical noise. Cars, fire, pools and bathtubs, poisons, abuse, and so on claim many fold more children. Regarding theft, it is a joke to think that criminals will not be able to disarm such electronic measures. Ever hear of jail-break phones? Ever hear of a Dremel tool? This is a undesirable solution in search of a problem and potentially a Trojan Horse for a gun deactivation worm/virus/back door for an evil government. Second, some gun owners, or, more likely, some prospective gun owners – people who will own a gun “but only if it’s safe enough” – will buy a smart gun. Many of these new “gun owners” will neither understand nor practice gun safety because “smart guns won’t fire unless the chip is close by.” That means they must never be allowed anywhere near a non-smart gun because their ignorance and incompetence will be fatal to others. They will also be completely unaware of just how fragile the technology is because they will believe they purchased a gun when what they actually bought was mass produced software packaged in a small portable computer that expels projectiles at high velocity. I won’t even go into the hazards of antisocial hacking or back alley conversions of smart guns into non-smart guns. And, these people must not be regarded as “dependable” in any meaningful way because nothing they have obtained for supposed emergency use will be reliably usable in that emergency, so if the crap hits the fan not only will you be completely on your own, the smart gun owner will likely be an operational burden. As I’ve said before, the people who think this is ‘the solution’ are either woefully uneducated or deliberately untrustworthy. I honestly think the former believe firearms are like some kind of Star Trek phaser, rather than a simple mechanical device whose complexity really isn’t THAT much further along than your average crossbow. There’s a concept called ‘hardening’ — and I can see our former and current military types nodding even as I type — where you can build electronics to be shock resistant. But it’s a lot of work and its expensive. I don’t want to think about how much sweat goes into making sure the targeting systems of an Abrams MBT don’t go wonky when that main gun fires. Yes, I too object even to the existence of these things. One reason is that I don’t like camels to stick their noses into my affairs, which this is. The other reason is that it’s clear to me the people pushing this technology are criminals, every one of them, and I don’t want them to get away with their criminal plans. Sound of someone kicking a door. 911 Operator: Clickity, clickity, click. “The system shows no criminal activity in your neighbothood. Your request is denied. An officer will come by to investigate. ” Hangup. Loud crash as door is kicked open followed by 20 minutes of sounds of hacking, chopping, slicing, dicing & juliennIng interspersed with screams, cries, moans, etc. Silence. Intruder: “Waddaya want!” Sound of zipper. Sound of footsteps leaving followed by wind whistling past open door. Q) how does the little old lady stuck in Detroit on a fixed income afford a smart gun to protect here self from the growing gang threat in her neighborhood? A) she can’t. She gets robbed monthly until one day a delusional drug user breaks in, rapes her, and bludgeons her to death. There are probably many more I missed as well.